Background: Many consumers avoid eating beans because they believe legume consumption will cause excessive intestinal gas or flatulence. An increasing body of research and the 2010 Dietary Guidelines for Americans supports the benefits of a plant-based diet, and legumes specifically, in the reduction of chronic disease risks. 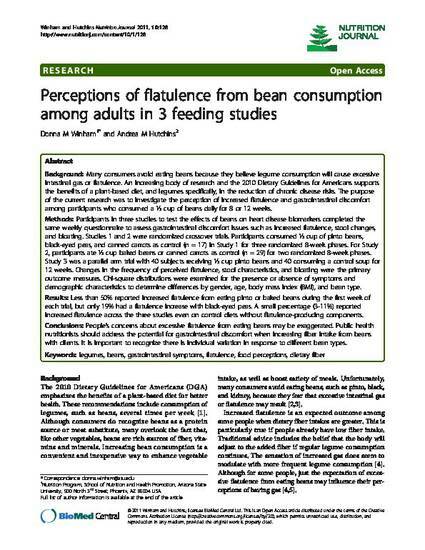 The purpose of the current research was to investigate the perception of increased flatulence and gastrointestinal discomfort among participants who consumed a ½ cup of beans daily for 8 or 12 weeks. Methods: Participants in three studies to test the effects of beans on heart disease biomarkers completed the same weekly questionnaire to assess gastrointestinal discomfort issues such as increased flatulence, stool changes, and bloating. Studies 1 and 2 were randomized crossover trials. Participants consumed ½ cup of pinto beans, black-eyed peas, and canned carrots as control (n = 17) in Study 1 for three randomized 8-week phases. For Study 2, participants ate ½ cup baked beans or canned carrots as control (n = 29) for two randomized 8-week phases. Study 3 was a parallel arm trial with 40 subjects receiving ½ cup pinto beans and 40 consuming a control soup for 12 weeks. Changes in the frequency of perceived flatulence, stool characteristics, and bloating were the primary outcome measures. Chi-square distributions were examined for the presence or absence of symptoms and demographic characteristics to determine differences by gender, age, body mass index (BMI), and bean type. Results: Less than 50% reported increased flatulence from eating pinto or baked beans during the first week of each trial, but only 19% had a flatulence increase with black-eyed peas. A small percentage (3-11%) reported increased flatulence across the three studies even on control diets without flatulence-producing components. Conclusions: People’s concerns about excessive flatulence from eating beans may be exaggerated. Public health nutritionists should address the potential for gastrointestinal discomfort when increasing fiber intake from beans with clients. It is important to recognize there is individual variation in response to different bean types. This is an open access article distributed under the Creative Commons Attribution License, which permits unrestricted use, distribution, and reproduction in any medium, provided the original works is properly cited.